Are you guys so over my long tongue twister titles? Gosh, I hope not because I just can’t seem to keep em simple. I like em long and crazy. Can it just be my thing. Yeah, let’s just make it my thing. I have long titles and I like it. Oh but wait, before we get to these bars can we just talk about the snow real fast?? I just have to say that I SO called it. Sunday I said the next cloudy day we get, it’s gonna snow and what do you know, it snowed yesterday. Yup, real snow. The white stuff. Look and see for your yourself. I am ready for fall, but snow? No, not at all. I just want to see the pretty leaves, not the white. You know, it’s only September 23rd. What gives? Oh well, at least I still have a couple of these bars left. Now, I know this is kind of a lot in one bar, and honestly a lot for a Tuesday post, but I just got so excited about these that I had to share. I made these over the weekend and little by little just kept adding layers… upon layers. I just wanted to pile them up high. 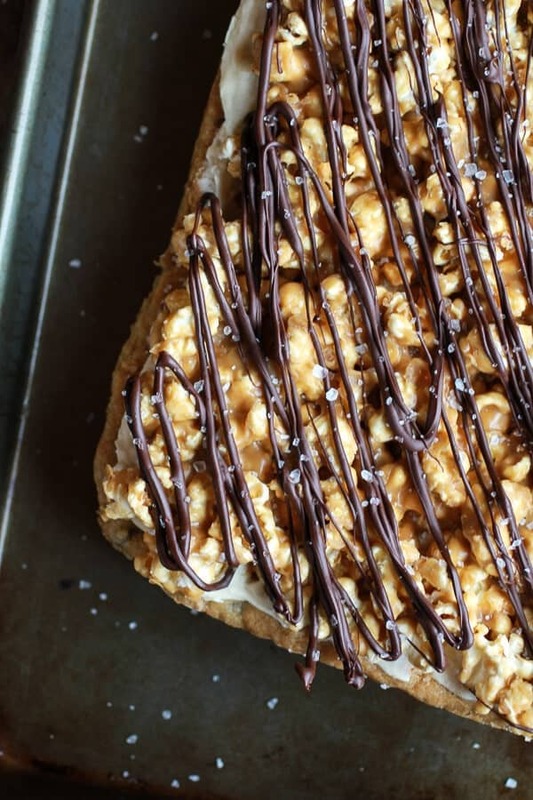 I wanted texture, I wanted sweetness, I wanted a little crunch, a little chew, a little peanut butter and a lot of chocolate. The only reason the peanut butter cups happened was because I am the world’s biggest sucker for the holiday candies. I am the the worst with Christmas, but Halloween comes in a close second. I am honestly not a candy person, but the second they start putting out the pumpkin Reeses and orange M&M’s I am a done for. I love holidays and I love their “themed” foods. It just makes me feel like a kid again. While I do love not having to stop every two seconds to tell Asher to stop throwing every last thing into the cart, I have to say I miss my little shopping buddy. Ok fine, I also miss the excuse to spend a good ten minutes in the Halloween isle. I kind of love that isle the most. Let’s just talk about the bars already. 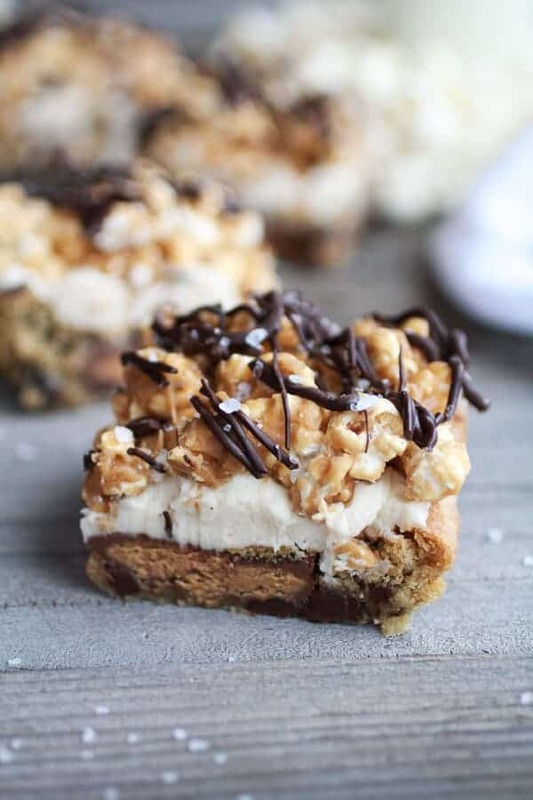 First you have the cookie layer that is stuffed with peanut butter cups, then there is the cream layer, which I stole from my homemade peanut butter Oreos (so good) and then there is the caramel popcorn. Like I said, they are crazy. And pretty easy too, just bake the cookies (so easy), beat the cream (even easier) and the make the caramel (pretty simple – promise). The hardest part is waiting for them to set. It’s like torture and I will not blame you if you need to dig in right away. Cause we totally did. And loved every gooey bite. First you have the cookie layer that is stuffed with peanut butter cups, then there is the cream layer, which I stole from my homemade peanut butter Oreos (so good) and then there is the caramel popcorn. Make the cookie base. Preheat the oven to 350 degrees F. Grease a 9x13 inch baking pan or line with parchment paper. Combine the flour, baking soda and salt in small bowl. Beat the butter, granulated sugar, brown sugar and vanilla extract in large mixer bowl until creamy, about 3 to five minutes. Add the eggs one at a time, beating well after each egg. Gradually beat in the flour mixture and the 2 teaspoons of water. Stir in the chocolate chips. Spread half the dough out into the prepared pan, push the Reese into the dough and then drop the remaining dough around the Reese. Smooth out a little (it will not completely cover all the Reese's). Bake for 18 to 25 minutes, just until set in the center. Allow to cool completely before adding the cream layer. I like to stick mine in the freezer for 30 minutes to make this go a little faster. To make the cream/frosting/ filling layer. In a mixer, beat the butter until smooth and creamy. Add sugar, vanilla and salt and beat until smooth. Spread the cream over the cooled cookies, the layer will be thin. To make the popcorn. Combine the brown sugar and water in a small saucepan over medium-high heat. Bring the mixture to a boil. Once it begins to boil watch closely and whisk until the mixture starts to smell like caramel and turn a golden color, and then to a light brown. This will take about 5-6 minutes. When you see that it has started to turn brown add the butter and slowly pour in the cream, whisking constantly and quickly. Continue to heat over medium-high until mixture has thickened and is a light caramel color, about 5 to 10 minutes more. Remove from the heat and stir in the peanut butter or butterscotch chips (I used butterscotch) vanilla and a good pinch of salt, stir until smooth. Add the popcorn to a large bowl and pour the caramel over the popcorn. Toss well and then spread the popcorn over the cream layer, make sure to get out all the caramel out of the bowl! If desired drizzle with melted chocolate and then sprinkle with a good amount of flaked sea salt. Let sit at least 1 hour before cutting or place in the fridge to help them set faster. Then cut into bars! 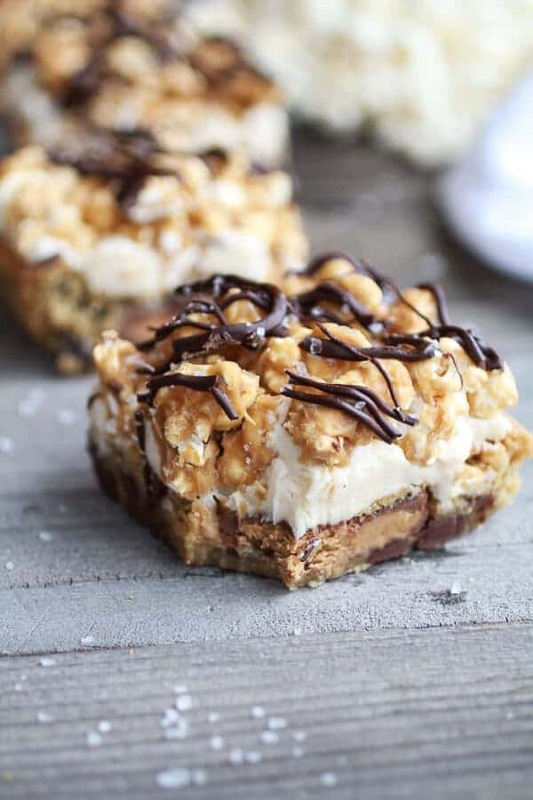 No-Bake Triple Decker Peanut Butter S’mores Bars. These really are insane! Omg I can’t even imagine the palate explosion! I want, I want, I want! Oh, my stars! Tieghan, you have outdone yourself…yet again. I am totally making these this fall and cannot wait! All of my favorites are here in one chewy bar. NOM-NOM! Thank you for sharing, girl. Pinning everywhere! xo P.S. My waistline hates you! Paleo? What paleo diet? Help. Me. Wow! Seriously…how do you come up with these things?! I want your brain! These sound so good! 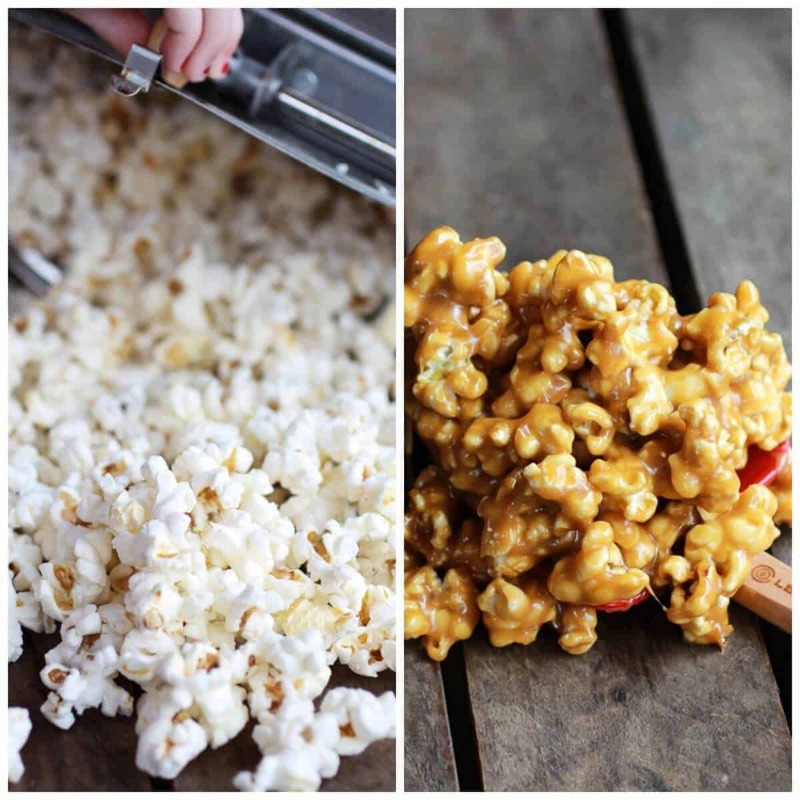 I never would have thought to use caramel popcorn like this! Thanks Kevin!! 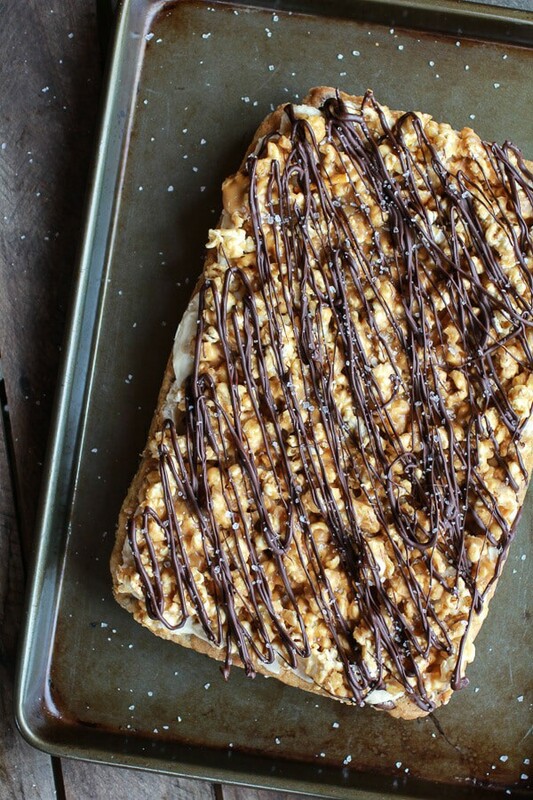 I am sure you could think up some awesome way to use caramel corn though! You’re killing me, Tieghan! Another awesome recipe!! Yum yum… I love salted caramel. If the recipes all look like these keep those tongue twisting titles coming! 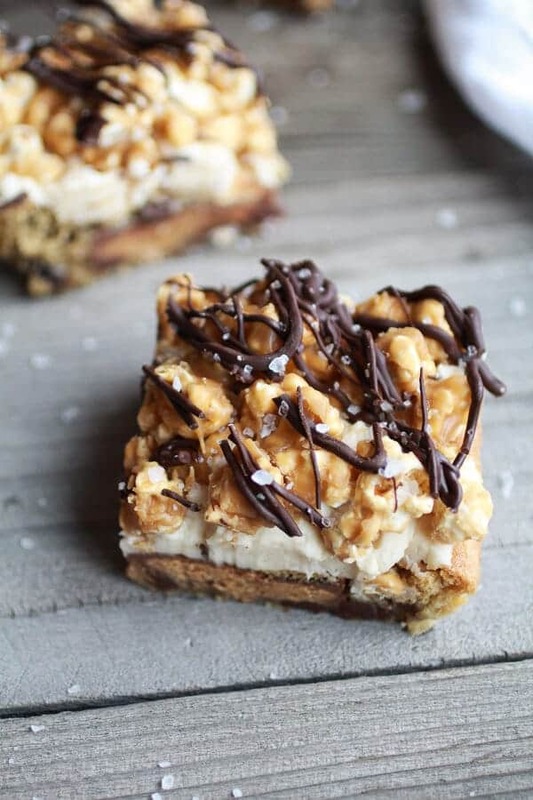 These bars look swoonworthy! 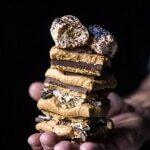 Oh my – these look incredible! Heck yes! Coconut on top? SHould have done that! Keep those tongue twister titles comin’ woman!! I am always blown away every time! That’s it! I’ve had enough of your brilliance, Tieghan. If I can’t live in your Willy Wonka head, then I don’t want to live. 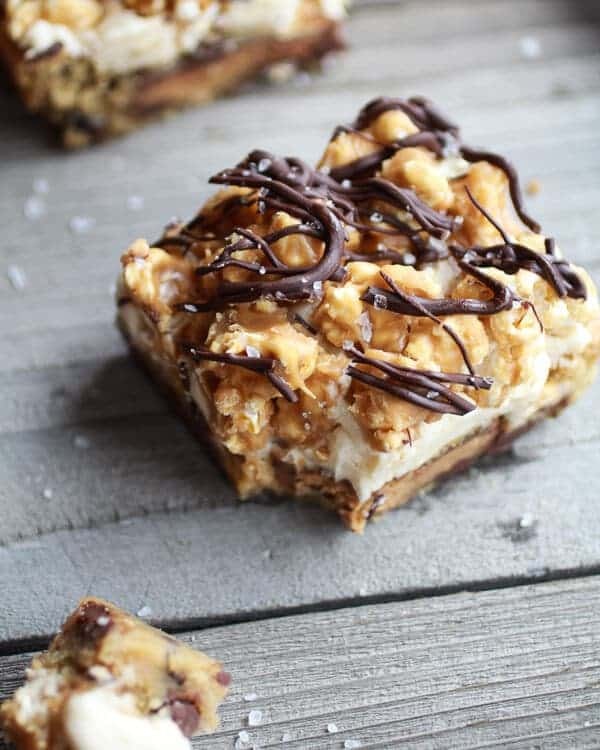 Holy smokes, I am drooling over these bars! They are, quite literally, the PERFECT combination of sweet and salty. And the texture! Overload of awesome 🙂 and btw, I, too, am a sucker for holiday candy! You should see my pantry.. I hoard the stuff like it’ll never return. 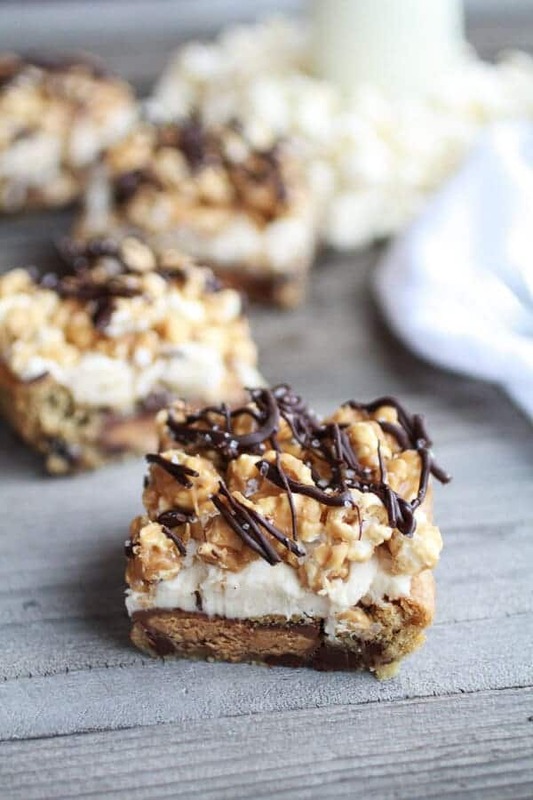 Now these are some sweet dessert bars. I can’t believe it’s snowing where you are! It’s still in the 80s in Los Angeles. And these bars look spectacular. You could sell them and make millions. It was so cold here this morning. In the 20’s! The creama layer. I want to live there. Oh and the salted caramel corn. And the cookie dough. These have it all going on! Flavor overload! I love your insane creations Tieghan! Awesome!!!!! I love the entire flavor combination! I cannot wait to give this a try! These bars look insane! Love all the flavors and those flakes of sea salt just make the photos! Thanks Laura! I love using flaked sea salt for taste and photos! Tieghan, these look fabulous! They are loaded with what I love. You are amazing. And so are these bars. WORD. 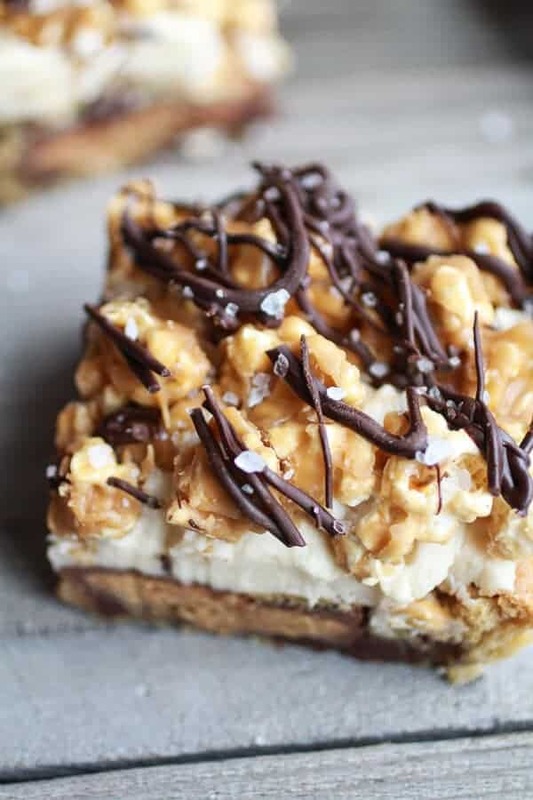 I love every single layer in these bars! Thanks Sally!! Love your bites of life post today! So happy for you! Oh wow, YUM. Sounds and looks amazing! 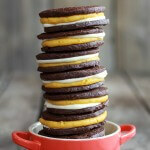 OMG these look totally ridiculously out of this world!! So creative, so many incredible layers working perfectly together, and the sea salt on top totally won me over (as if I wasn’t obsessed already…)! Thank you so much, Ari! I want to die in these. these look insanely good! great recipe! if there were a talent meter – you’d be off the charts!!! I’m so curious, besides this blog (which I think you are running really really well) are you going to pursue food as a career? You ought to – the food world needs you! Awe, thank you so much!! I have not thought about that at all, for right now I am very happy doing what I a doing!! Oh my gosh, these look ridiculous- in the best possible way! These look RIDICULOUSLY good. Oh my word. I honestly can’t think of anything else to type. Must. Make. These look crazy awesome delicious bonkers good. Wow, snow! I’m so not ready for snow. You can keep it. Haha! I do not want it! LOL! Oh, your recipe made me think of my father’s birthday (in October). I’ll go and train to make it couple of times and than cook it for his special day. I believe I’ll get sophisticated taste that he will remember for long. Can I decorate the upper layer with some more chocolate (or coconut flakes) or what would you recommend? 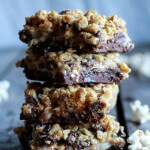 Yes to the more chocolate and toasted coconut flakes! That sounds awesome! Hope you guys all love these! Where I do I start, they look amazing! Snow?? Noooo!! I Hope it doesn’t end up snowing again for you for quite awhile! You need to be able to enjoy this delicious Fall weather a bit longer! 😉 And these bars? Holy. Bananas. They are INSANE in an awesome way!!! I could not agree more, but it will snow again. It’s just what happens aound here this time of year. OMG I totally bought the ingredients for this last night and was going to make them tonight, and now the recipe won’t show up- help me pleeeease! I’m so excited to try them out! Kara, I am SO incredibly sorry! My site has been completely down for hours and totally crashing. I feel so, so, so bad you never got to make these! The recipe should hopefully be there now (crossing my fingers!). Again, so sorry I feel terrible!! let me know if you have any more problems! 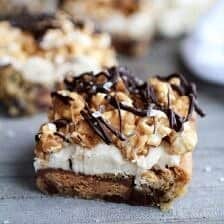 Ok so I totally went and got the ingredients for these last night and was going to make them tonight, and now I can’t find the recipe here, or anywhere- pleeease help! 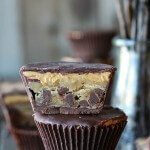 I’m so excited to make these! I tried making these last night and have two questions. First off – when you say “1/4 butter” – is this 1/4 cup or 1/4 stick? I tried 1/4 cup butter. After adding the cream and butter, I heated it for probably less than 5 minutes, and it started to boil (is this ok?). I then took it off the heat, mixed in the peanut butter, and poured it on the popcorn – only to see the popcorn shrivel up into less than 1/4 the volume. Do you have any tips, on what I might have done wrong? I threw out that popcorn, and was going to try it again tonight. When I say 1/4 cup butter, I do mean a 1/4 cup. Not a 1/4 a stick. As for the caramel, it is ok for it to come to a boil, but don’t boil it for longer than 5-8 minutes. If it goes above 245 degrees the caramel will harden too much. I am not sure why your popcorn shriveled up, but try letting the caramel sauce cool for 5 minutes before pouring it over the popcorn. The heat from the super hot caramel probably caused it to shrivel. But my did not do that and never has, so it is a little weird. OK, I really hope this solves your problems! Let me know if you have any more questions and I hope these turn out and you love them! Thanks for the fast reply. I will try letting it cool tonight and see if it works better, I’d never had that happen before when making caramel corn either. – Also, you are missing the word “cup” from the caramel ingredient list above (it says “1/4 butter”) – that is why I asked. I made this recipe, and every part of it turned out great except for the salted caramel popcorn, which turned out very soft and soggy after I poured the caramel on it…the corn never crisped up, even after the caramel hardened. I googled this, and it turns out that caramel corn is *always* supposed to bake in the oven, once the caramel and corn are combined, to make it crispy and crunchy. If I make this recipe again, I definitely will include that step. I really think it would be great if you could update your recipe to note that the caramel corn is supposed to be baked before topping the vanilla filling, because otherwise, the popcorn topping is soggy and throws off the entire textural balance of the cookie, and in my opinion, makes the recipe a waste of effort and money. It definitely can influence it! Thanks so much Serena!! What? 10-12 cups of peanut butter!? It is 10-12 peanut butter cups. Please let me know if you have any other questions. I hope you love this recipe. Thank you!